For the country singer, see Loretta Lynn. Loretta Elizabeth Lynch (born May 21, 1959) is an American lawyer who served as the 83rd Attorney General of the United States from 2015 to 2017. She was appointed by President Barack Obama to succeed Eric Holder and previously served as the United States Attorney for the Eastern District of New York under both President Bill Clinton (1999–2001) and Barack Obama (2010–2015). As a U.S. Attorney, Lynch oversaw federal prosecutions in Brooklyn, Queens, Staten Island and Long Island. Born in Greensboro, North Carolina, Lynch graduated from Harvard Law School in 1984. She then practiced law in New York and became a federal prosecutor in 1990, rising to become head of the Eastern District office. She later returned to private law practice, until she again became the top district prosecutor. From 2003 to 2005, she served on the board of the Federal Reserve Bank of New York. On November 8, 2014, President Barack Obama nominated her to succeed Eric Holder as Attorney General. On February 26, 2015, the Judiciary Committee of the United States Senate recommended her confirmation by a 12–8 vote, with all Democrats of the committee and three Republicans in favor. 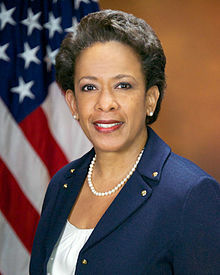 On April 23, 2015, Lynch was confirmed by the Senate by a 56–43 vote, making her the second African-American, the second woman and the first African-American woman to be confirmed for the position. She was sworn in as Attorney General on April 27, 2015. Her tenure ended on January 20, 2017, when Donald Trump was sworn in as President of the United States. Lynch was born on May 21, 1959, in Greensboro, North Carolina. Her mother was a school librarian and her father a Baptist minister. As a child, she spent hours with her father, watching court proceedings in the courthouse of Durham, North Carolina. Her early interest in court proceedings was compounded by stories of her grandfather, a sharecropper and pastor, who in the 1930s helped people move to the north to escape persecution under the racist Jim Crow laws of the time. Lynch earned a Bachelor of Arts in English and American literature from Harvard College in 1981 and a Juris Doctor from Harvard Law School in 1984, where she was a member of the Harvard Legal Aid Bureau. She is a member of Delta Sigma Theta sorority, and was a charter member of the Xi Tau chapter of the sorority while at Harvard. Replacing Lynch, Robert Capers was confirmed by the U.S. Senate as U.S. Attorney for the Eastern District of New York on December 15, 2015, taking his oath of office on January 4, 2016. Eight Republicans on the Senate Judiciary Committee, including the chairman, Chuck Grassley, had opposed Lynch's confirmation after what Democrats criticized as a record-long delay. Grassley defended delays in holding the vote, saying it was important to gather more information on Lynch's role in settling a $1.9 billion money-laundering deal with HSBC when she served as United States Attorney in New York. Republican Senator David Vitter criticized recent admissions by Lynch that she had failed to find out about separate documents revealing HSBC's role in helping clients hide money offshore before agreeing not to prosecute the bank. Rand Paul, though not on the committee, opposed her nomination for her support of civil forfeiture. On April 23, 2015, cloture was invoked on her nomination by a vote of 66 to 34. Her appointment was confirmed the same day by a 56 to 43 vote. Her nomination process was one of the longest in the history of the United States, taking 166 days after she was first nominated for the post. She was sworn in by Vice President Joe Biden on April 27, 2015. On December 7, 2015, Lynch stated the Justice Department would be investigating the Chicago Police Department to see if there was a potential violation of civil rights in the case of Laquan McDonald. On March 3, 2016, following the occupation of the Malheur National Wildlife Refuge, Lynch said charges would be filed soon against participants in the standoff while appearing in Portland, Oregon to commemorate the community's policing. In April 2016, Lynch took an active role in addressing what she called the difficulty of re-entry into society by felons, writing an op-ed and making public appearances in support of raising awareness of this blight on their transition, also calling on governors to make it easier for released felons to achieve state-issued identification. In May 2016, Lynch delivered the commencement address at Spelman College in Atlanta, Georgia. In June 2016, in response to the Orlando nightclub shooting, Lynch made multiple appearances on television news shows to highlight the ongoing investigation of the FBI, disclosing that edited transcripts of the conversation between the shooter, Omar Mateen, and the FBI negotiators would be released. On June 21, Lynch traveled to Orlando to both meet with survivors and inquire into the ongoing investigation, also bringing with her $1 million in emergency funding for Florida, Orange County, and Orlando to help pay for overtime and other investigative costs. In October 2016, Lynch removed the Brooklyn FBI agents and federal prosecutors from the death of Eric Garner case, replacing them with agents from outside New York. The local FBI agents and federal prosecutors had determined that charges should not be brought in the case, prompting strong disagreement from attorneys in the Washington, D.C. office of the Department's Civil Rights Division. Lynch's intervention has been called "highly unusual". On June 27, 2016, Lynch and former President Bill Clinton met privately aboard Lynch's Justice Department jet, which was parked on the ramp in Phoenix, Arizona. ABC15 Phoenix reporter Christopher Sign broke the story on June 29, citing unnamed sources. The following day, during a press conference in Phoenix, Lynch denied the conversation was about the Hillary Clinton email controversy or any matters pertaining to it, saying the discussion instead involved personal social topics such as travels, golf, and grandchildren. On July 1, 2016, Lynch swore she would "fully accept" the recommendation of the FBI and prosecutors regarding the email probe, and admitted that she understood how the meeting was raising "questions and concerns", and that she "certainly wouldn't do it again". On July 6, a day after FBI Director James Comey recommended not pressing charges against Clinton, Lynch confirmed the Justice Department had opted to not pursue charges against Clinton and would close the probe into her private email server. On July 12, Lynch testified before Republican lawmakers, on the legal basis of the Justice Department's choice to not prosecute Clinton. On June 8, 2017, former FBI head James Comey testified under oath that Lynch had instructed him (during the course of a private conversation) to not refer to the Clinton email scandal as an "investigation" and instead refer to it as a "matter". He also said that the directive, combined with Lynch's Phoenix ramp meeting with former President Clinton, led him to make his independent announcement regarding the Clinton email probe last July. In his closely watched Senate Intelligence Committee testimony, otherwise devoted to discussing the circumstances of his firing, Comey said that tarmac meeting was a "deciding factor" in his decision to act alone to update the public on the Clinton probe—and protect the Bureau's reputation. On June 2017, the Senate Judiciary Committee launched a bipartisan investigation into whether or not Lynch tried to interfere with the Hillary Clinton email investigation. The following month, Lynch issued a statement through her lawyer pledging to cooperate with the investigation and denying the allegation she had given assurances to a Clinton campaign staffer that she would limit the email investigation. The Department of Justice Inspector General also investigated the handling of the Clinton email investigation. The Inspector General's report, released in June 2018, called Lynch's tarmac meeting with Bill Clinton an error of judgment for the public perception it created, however the report found no political bias. Lynch married Stephen Hargrove in 2007. In her personal life she uses her married name, Loretta Lynch Hargrove. Her husband has two children from a previous marriage. ^ a b "Loretta Lynch, Federal Prosecutor, Will Be Nominated for Attorney General". The New York Times. November 7, 2014. Retrieved November 7, 2014. ^ a b c d Clifford, Stephanie (November 8, 2014). "Loretta Lynch, a Nominee for Attorney General, Is Praised for Substance, Not Flash". New York Times. ^ "Obama to tap Loretta Lynch for AG", AP/New York Post, November 7, 2014. Retrieved November 8, 2014. ^ Joseph P. Fried (July 14, 1999). "Schumer Urges Carter's Aide For U.S. Post". The New York Times. ^ "Attorneys at the top succeeding in spite of dismal diversity trends", The Network Journal, 2014. Retrieved November 4, 2014. ^ "Biographical Information for Loretta Lynch", AP/ABC News. November 7, 2014. Retrieved November 8, 2014. ^ a b The White House: Office of the Press Secretary (January 20, 2010). "President Obama Nominates Five to Serve as U.S. Attorneys". WhiteHouse.gov. Archived from the original on January 24, 2011. Retrieved March 13, 2011. ^ Rhodan, Maya (January 15, 2015). "Loretta Lynch's Sorority Sisters Came to Her Attorney General Confirmation Hearing". Retrieved April 25, 2015. ^ "Xi Tau History". Retrieved April 25, 2015. ^ Woodrow, Stephanie (February 12, 2010). "Meet Loretta E. Lynch". Main Justice. Retrieved March 13, 2011. ^ Sulzberger, A. G. (January 20, 2010). "Obama Picks Loretta E. Lynch for Brooklyn U.S. Attorney". New York Times. Retrieved March 13, 2011. ^ Loretta E. Lynch, NNDB, 2014. ^ Genevieve Belmaker, "Calls for Calm Ahead of Staten Island Rally in NYC", Faith in New York, August 21, 2014. ^ Tom Hays, "Family of man killed by NYPD chokehold talks to feds", Brooklyn Daily Eagle, August 22, 2014. ^ Aruna Viswanatha and Julia Edwards. "Brooklyn Prosecutor Loretta Lynch Emerges As A Top Candidate For Attorney General". Huffington Post. Retrieved October 28, 2014. ^ "United States of America vs HSBC Bank USA, N.A. and HSBC Holdings Pl. Memorandum and Order July 1, 2013". Retrieved November 7, 2014. ^ Apuzzo, Matt; Clifford, Stephanie; Rashbaum, William (May 27, 2015). "FIFA Inquiry Yields Indictments; U.S. Officials Vow to Pursue More". New York Times. ^ "U.S. Attorney General Loretta Lynch Talked FIFA Corruption On Men In Blazers". Retrieved April 19, 2016. ^ Casey, Nicholas (8 October 2015). "Robert Capers, Brooklyn Prosecutor, Nominated for U.S. Attorney Post". New York Times. Retrieved 20 October 2015. ^ Meet the U.S. Attorney: Robert L. Capers, The United States Attorney's Office, Eastern District of New York. Retrieved 13 April 2016. ^ a b Athena Jones, "Loretta Lynch makes history", CNN, April 23, 2015. ^ "Obama picks NY prosecutor Lynch to be next attorney general", Yahoo! News, November 8, 2014. Retrieved November 8, 2014. ^ Dan Roberts, "Loretta Lynch's nomination for attorney general approved despite HSBC scandal", The Guardian, February 26, 2015. ^ "Rand Paul Won't Back Loretta Lynch For Attorney General". ^ "U.S. Senate: Roll Call Vote". senate.gov. January 27, 2015. ^ "Senate Confirms Loretta Lynch as Attorney General 166 Days After Nomination". ABC news. Retrieved 27 April 2015. ^ "Loretta Lynch Is Sworn In as Attorney General". New York Times. Retrieved 27 April 2015. ^ Abdullah, Halimah (July 22, 2015). "AG Lynch: Dylann Roof Indicted on 33 Counts, Hate Crime Charges". ^ Johnson, Kevin (May 24, 2016). "Lynch: Justice Dept. to seek death penalty against Dylan Roof". USA Today. ^ Rodgers, Phil (December 7, 2015). "U.S. Attorney General Loretta Lynch Announces Probe Into Chicago Police Department". ^ "AG: More Charges Coming 'Very Soon' In Masher Occupation". opb.org. March 3, 2016. ^ Helm, Angela Bronner (March 8, 2016). "Loretta Lynch Asks to Be Withdrawn From SCOTUS Consideration". theroot.com. ^ "Loretta Lynch: Remove roadblocks faced by former prisoners re-entering society". USA Today. April 27, 2016. ^ "Attorney General Loretta Lynch To Visit Mobile". wkrg.com. April 28, 2016. ^ "Loretta Lynch to States: Ease Way for Ex-prisoners to Get IDs". newsmax.com. April 25, 2016. ^ Wolf, Richard (June 18, 2016). "Attorney General Loretta Lynch to dominate news shows". USA Today. ^ "ATTORNEY GENERAL LORETTA LYNCH SAYS INVESTIGATION INTO ORLANDO GUNMAN OMAR MATEEN MOVING FORWARD". abc7chicago.com. June 19, 2016. ^ Pearson, Michael (June 21, 2016). "Attorney general visits Orlando". CNN. ^ a b c Matt Apuzzo; Adam Goldman; William K. Rashbaum (October 25, 2016). "Justice Dept. Shakes Up Inquiry Into Eric Garner Chokehold Case". The New York Times. p. A1. Retrieved October 26, 2016. ^ Sign, Christopher (July 4, 2016). "Loretta Lynch, Bill Clinton meet privately in Phoenix". ABC15 News. ^ "Bill Clinton and AG Loretta Lynch meet privately". CNN. June 30, 2016. ^ Levine, Mike (July 1, 2016). "Attorney General Loretta Lynch Calls It 'Perfectly Reasonable' to Question Bill Clinton Meeting". ABC News. ^ "Attorney General Loretta Lynch says DOJ will not pursue charges against Clinton". Politico. July 6, 2016. ^ Slack, Donovan (July 12, 2016). "GOP lawmakers grill attorney general over Clinton emails, get few answers". USA Today. ^ Kopan, Tal (June 8, 2017). "Comey: Lynch asked for Clinton investigation to be called a 'matter'". CNN. Retrieved August 14, 2017. ^ Singman, Brooke (June 8, 2017). "Comey says Lynch tarmac meeting, directive to downplay probe prompted him to go rogue on Clinton case". Fox News. Retrieved August 14, 2017. ^ "Comey: Lynch told me not to call probe of Clinton emails an investigation". USA Today. June 8, 2017. Retrieved August 14, 2017. ^ Parkinson, John (June 23, 2017). "Senate probes Loretta Lynch's alleged interference in Clinton email investigation". ABC News. ^ Wright, Austin (July 6, 2017). "Loretta Lynch denies offering assurances to Clinton campaign over email probe". POLITICO. Retrieved October 20, 2017. ^ CBS News (June 14, 2018). "Highlights of DOJ Inspector General report on handling of Clinton email probe — live updates". CBSNews.com. Retrieved June 14, 2018. ^ Johnson, Carrie (June 14, 2018). "Report Condemns FBI Violations In 2016 Clinton Probe But Finds No Political Bias". NPR.org. Retrieved June 14, 2018. ^ "Obama To Nominate Loretta Lynch As U.S. Attorney General", AP/Huffington Post, November 7, 2014. Retrieved November 8, 2014. "BBC Radio 4 - Profile, Loretta Lynch". BBC Online. May 3, 2015. Retrieved May 3, 2015. 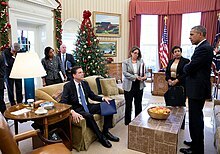 Wikimedia Commons has media related to Loretta Lynch. This page was last edited on 16 April 2019, at 02:36 (UTC).